“If You Liked…” is a new series where I’ll take recently released or upcoming movies, games, or TV shows and make some comic book recommendations. 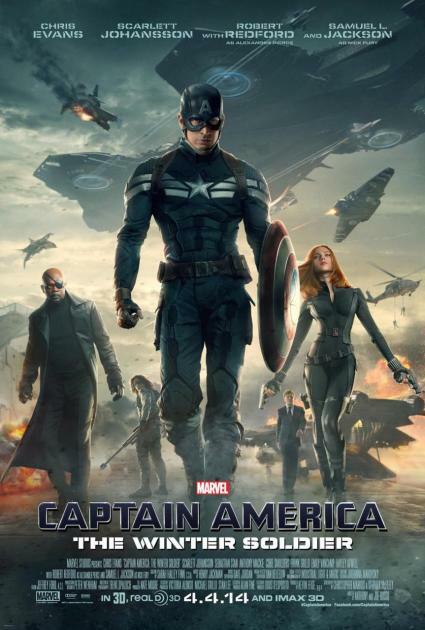 Earlier today, I had the chance to see Marvel’s latest superhero flick, Captain America: The Winter Soldier. It astounded me how thematically different it was from its predecessor. The first film, The First Avengers, was for all intents and purposes, a pulp action World War II period piece, similar to The Rocketeer (no surprise, given that they share the same director, Joe Johnstone). Winter Soldier, however, has more in common with more recent espionage thrillers such as the rebooted James Bond series or the Jason Bourne movies. There’s a great deal of modern action, smoke and mirrors spy action, and how a time-displaced Captain America fits in a modern setting. Ordinarily, the “If You Liked…” series would include a number of recommendations, ranging from different creative teams. In this case, however, the movie takes very clear inspiration from one source: Ed Brubaker’s run on the title. A strong word of warning: while many of the stories were widely publicized, there are some major events that I’ll be spoiling and discussing. This will not only include some spoilers from The Winter Soldier film, but it is very likely these major events will be adapted and/or mirrored in future Captain America films. 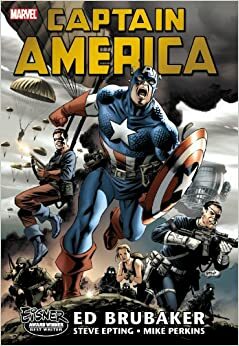 Ed Brubaker’s run with the character began in 2004, with a relaunched Captain America #1. Joined primarily by artist Steve Epting, Brubaker focused Captain America’s adventures on working closely with SHIELD and doing espionage missions. This hearkened back to Jim Steranko’s run on the title in the late 70s, who Brubaker has openly named as an influence. Brubaker’s Cap is not only a man out of time, but a man who lives in his work. Aside from some close allies, he lives a life in isolation, focused primarily on the job. For those that have seen The Winter Soldier, you would know that the movie very heavily mirrors this. Steve says to Black Widow early in the movie that he has no time to date because he’s “too busy.” In the comic, however, Steve does have time for one woman: Agent Sharon Carter (who appears in the movie). They work close together and at this point, are on again in their on-again/off-again relationship in the comics. The action is plenty in the comic and Steve Epting’s fantastic, detailed sequences never fail to amaze. In fact, nearly all action sequences have little to no dialogue, giving Epting full breathing room to tell the story, which he does with flair. The moment-by-moment panelling is like something straight out of a movie itself. There are three major events that Ed Brubaker’s run is famous for, all of which worked up fandom into quite a frenzy. First, he brought James “Bucky” Barnes back to life. Bucky had been dead since 1964, when an unfrozen Captain America told The Avengers of Bucky’s fate. For years, fans said that death is not permanent in comics…except for Bucky and (Spider-Man’s) Uncle Ben. Well, the former was no longer true, as Bucky was back as a brainwashed expert assassin, The Winter Soldier. Ordinarily, making a huge change in comics after 40 years would have many fans demanding the head of Ed Brubaker. Fortunately, there were some fantastic, intense character moments as Steve struggled with not only the realization that Bucky was alive, but how to stop him, and most importantly, free his old friend’s mind. The Winter Soldier himself soon became a fan favourite, with most of fandom embracing Bucky’s return with open arms, demanding he never go away. Well, they got their wish, but not in the way they expected. 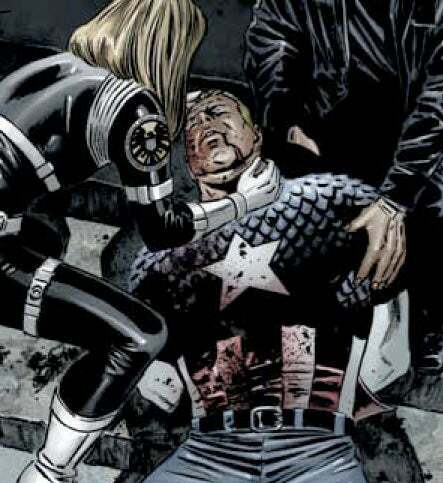 Brubaker’s run is most famous for Captain America #25 (April 2007), titled “The Death of Captain America.” It’s arguably the absolute highpoint of the excellent run, as an arrested Steve Rogers (fallout from Marvel’s crossover, Civil War) is brutally shot down on the court steps. Death, as I mentioned above, is rarely permanent in comics and this was no truer here. While there was some outrage from fans, most knew that Steve Rogers would eventually be brought back to life (certainly in time for his new film coming in 2012). And yet, even with its titular character dead and buried, the comic continued on without him. Characters reeled from the ramifications while the Red Skull moved closer and closer to his ultimate plan. Most readers had a good idea of where the series was moving, especially given that The Winter Soldier – long free from hypnotic control – had essentially taken the role of the series main character. Personally, I loved Bucky as Cap. And so, the third major event in Brubaker’s series was born: the long-dead and now returned Bucky Barnes became the new Captain America. Complete with a sleek new look and a sidearm, he was a different Captain America. Without a super soldier serum, he struggled with the role more than Rogers did, often needing the help of his allies more than Rogers. He was unquestionably his own man, though, and made the mantle his own in many ways. Of course, Steve Rogers did eventually return, during the obviously named mini-series, Captain America: Reborn. It would take far too long to explain all the ins and outs of how he returned, but needless to say, he did. However, he actually allowed Bucky to continue on as Captain America while Steve became the new head of SHIELD, wearing an outfit awfully similar to his new outfit in The Winter Soldier film. Of course, Steve eventually return to wielding the shield, complete with another rebooted series, again written by Brubaker and this time with artist Steve McNiven. The Winter Soldier is also still around, including his own solo series that was also written by Ed Brubaker. In retrospect, it’s surprising how long Marvel and Brubaker were able to keep Steve Rogers not only dead (three years), but then out of costume. It goes to show just how well-received Bucky was as Captain America. It was never a matter of if Steve would return to the shield, but when. Given that actor Sebastian Stan – who plays the role of Bucky Barnes and The Winter Soldier – has signed on for a whopping NINE Marvel films, it’s very likely that at some point, he will carry the shield and wear the Captain America mantle. How and when that transpires, though, is anyone’s guess. To be perfectly honest, the absolute best of the bunch is found during the first 50-some issues of Brubaker’s run, culminating in Reborn. It’s not that the rest is bad. Far from it. It’s just that after that wild, consistent ride, I find the rest of Brubaker’s run kind of fizzles out. The rest still hits more than it misses, but it doesn’t have that same gravitas that this 50-some issue run had. There was less mystery, as well, which was another big driving point behind the first 50 issues. It’s still incredibly impressive for one writer to work on one character for eight years. His love for the character and mythos shine through. Arguably, he made Captain America more interesting and relevant than he’s been in a long time. That said, Brubaker’s is one of my favourite writers, so I find any of his work to be fantastic. If you wind up picking up his run on Cap, I also highly recommend his creator owned books like Sleeper, Criminal, Incognito, Fatale, and most recently, Velvet. 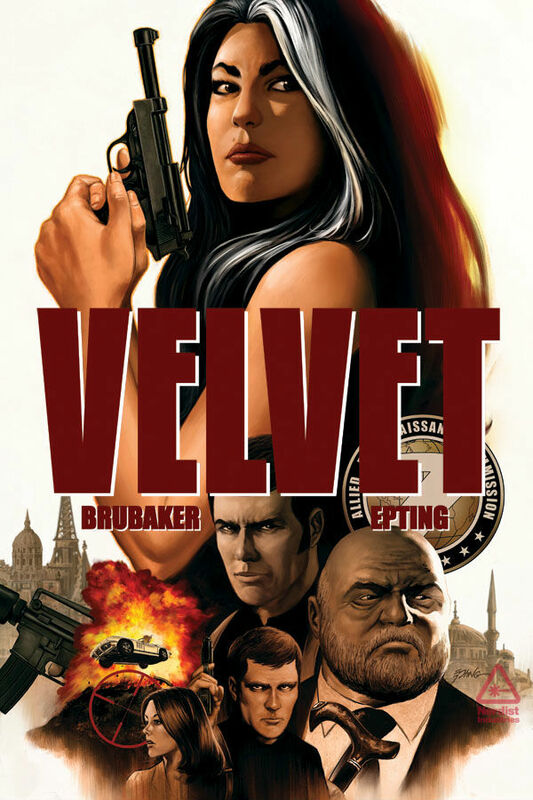 I should note that Velvet reunites Brubaker with his Captain America artist Steve Epting and the series has been strongly compared to their run. 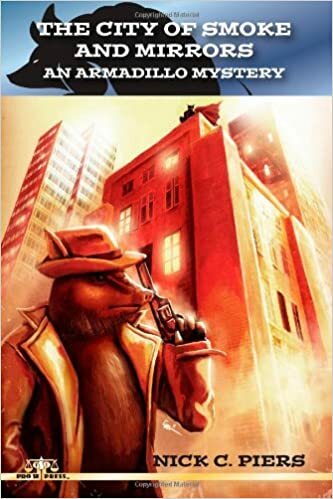 It’s got a lot of the same high octane action, espionage, and intrigue. You’re doing yourself a disservice by not reading it. If I were to recommend a great series with a solid, satisfying conclusion, I would suggest reading those first 50 issues and Reborn. Throughout the run, it’s endless spy games and superhero espionage complete with insane villains, action, and flying cars out the wazoo. If you’re interested, you can find a complete reading list of Ed Brubaker’s run with the character here. While they’re long out of print and likely impossible to find now, I love having the three huge Captain America omnibuses sitting on my shelf. However, Marvel has been good with keeping the softcovers of the rest in print, including a Winter Soldier omnibus that collects the first 12 issues of the series, as well as the massive Death of Captain America omnibus. I’m hoping someday in the future, Marvel will do a series of omnibuses like they have with the X-Men: Age of Apocalypse, Spider-Man’s Clone Saga, and both Brian Michael Bendis and Ed Brubaker’s runs on Daredevil. This entry was posted in Comic Books and tagged captain america, ed brubaker, if you liked, marvel comics, steve epting. Bookmark the permalink.